Keep these two options disabled if you want to protect the Internet-ID code and Internet-ID server settings on existing Hosts from being overwritten with new ones. Enable these options only if you want ALL of your Hosts - new and old - to be updated with the Internet-ID settings that you set in this tab. 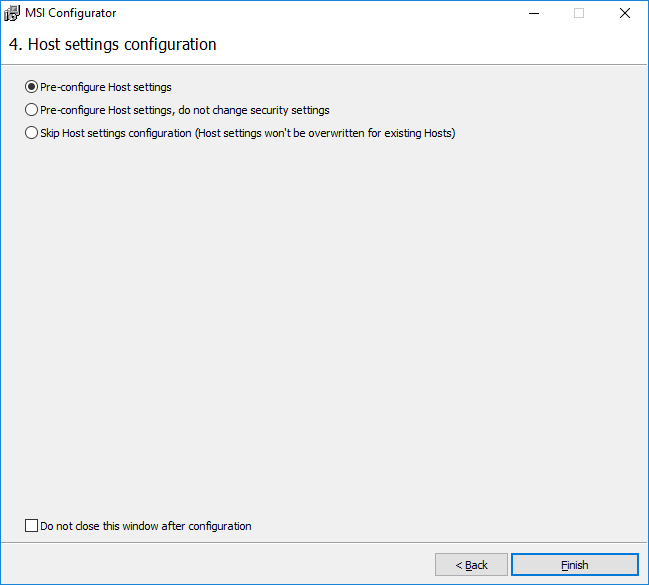 The "Host settings configuration" step (formerly "Settings update") was revamped. In this step you can pre-configure Host settings or skip Host settings configuration. You can also select whether you want to include or exclude security settings from configuration. Pre-configure Host settings Host will install with the settings you specified. ALL settings, including the security settings, will be overwritten and replaced with new ones. Pre-configure Host settings, do not change security settings Host will install with the settings you specified. Security settings, including access password will be empty/not set. The existing Host settings will be overwritten with new ones, except for the security settings which won't be affected. Skip Host settings configuration Host will install with the default settings. Security settings (including access password) will be empty/not set. Nothing will change. The settings will remain the same as they were prior to the update. Note that all Internet-ID settings are now configured separately from other Host settings. 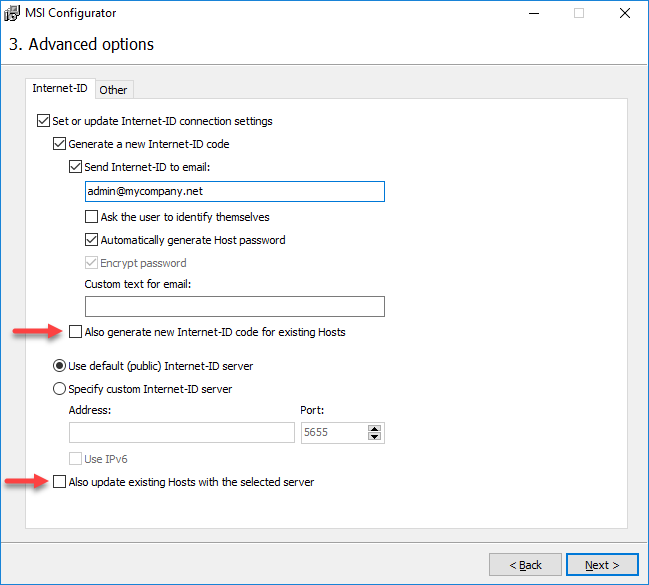 So regardless of what you selected in the Host Configuration step, the Internet-ID settings will be taken from the 3rd step "Internet-ID" tab of the MSI configurator. It should be noted that while you can build a custom Host installer that suits any situation, we still recommend that you configure separate installers each for its specific purpose. The most obvious approach is to use one installer for first-time installations and another one for updating existing installations. 1. New installation. Use the MSI Configurator to build a custom Host installer with all the settings that you need. Deploy the custom installer on computers where Host wasn't installed previously. 2. Host update. 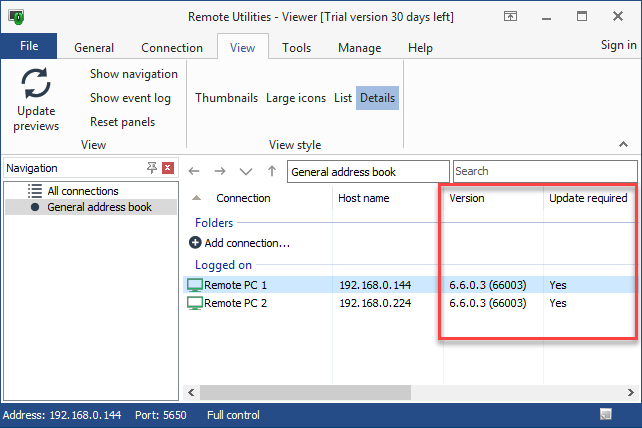 If you just want to run remote Host update without changing any of the Host settings you don't have to build a custom-configured installer. Use the default (vanilla) Host installer instead. One of the ways to do that is to use the Simple Update - a new update mechanism now available, see further below. 3. Host update + Settings update. 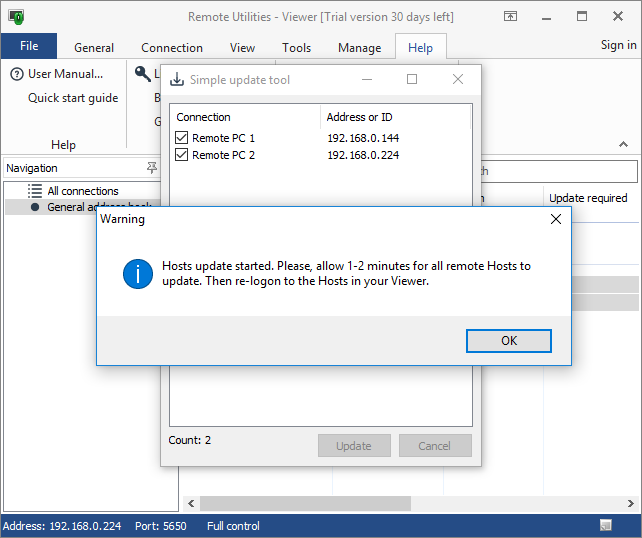 If you need to update both the Host itself (the program) AND its settings, build a custom installer and deploy it across the Hosts that need updating. When employing this strategy, be careful with the choices you make in the MSI configurator so as to avoid the risk of losing connectivity with your Hosts. A good practice is to test-update a small portion of remote Hosts first to see if you configured everything properly. 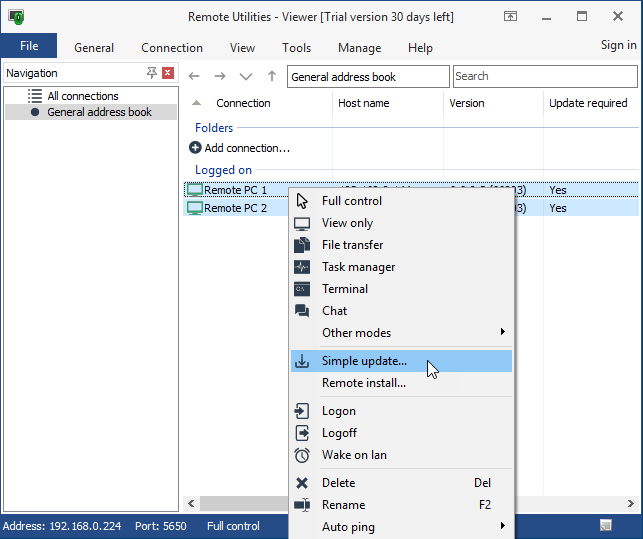 We are excited to announce Simple Update - a feature that lets you make remote Hosts self-update by your command. This feature can be used for updating Hosts starting from version 6.6.0.3 and later. For example, if you have 6.6.0.3 installed, you can update to 6.6.0.5 (the current release as of this writing) using Simple Update. Simple Update was first implemented in version 6.6.0.3. 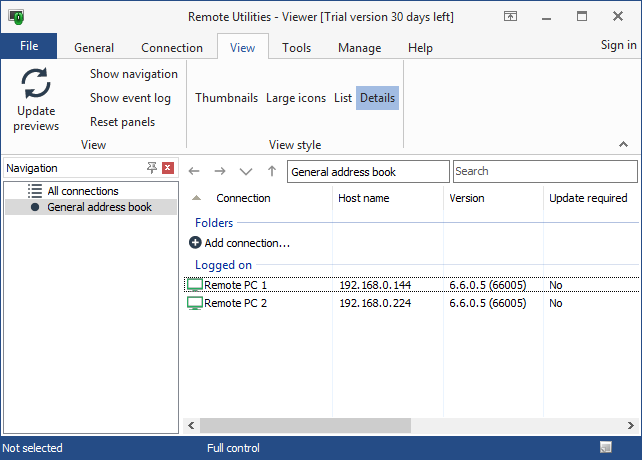 Therefore you can only use this system to update Remote Utilities 6.6.0.3 and later. It is technically impossible to update earlier versions using Simple Update simply because earlier versions don't have the necessary program code. 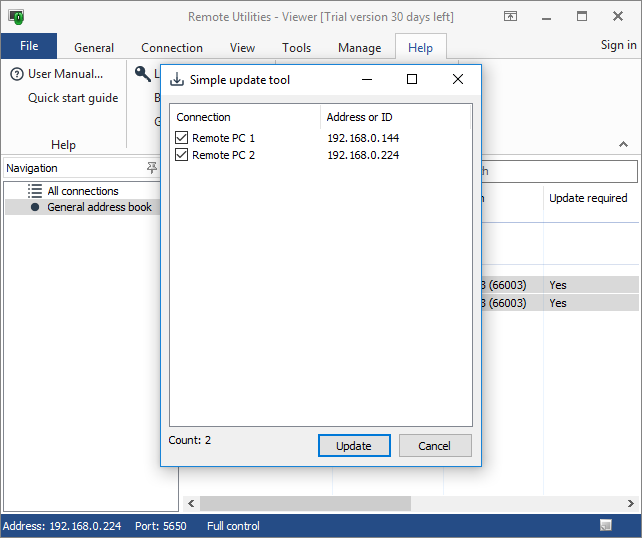 Simple Update updates the program itself and doesn't alter any existing Host settings (see strategy #2 in the previous section above). 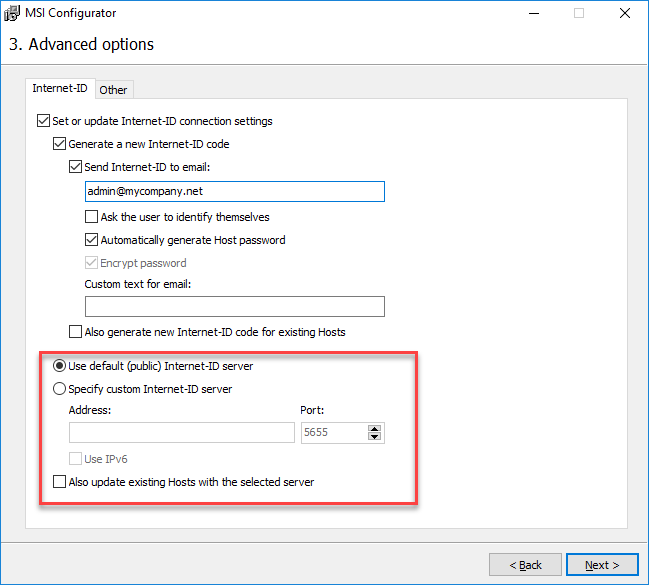 If you want to also update the Host settings, you must use the MSI Configurator to build your custom package and then distribute it across your remote Hosts. Updating the Viewer now is as simple as clicking a button. If you install an outdated Viewer the program will ask if you want to update. 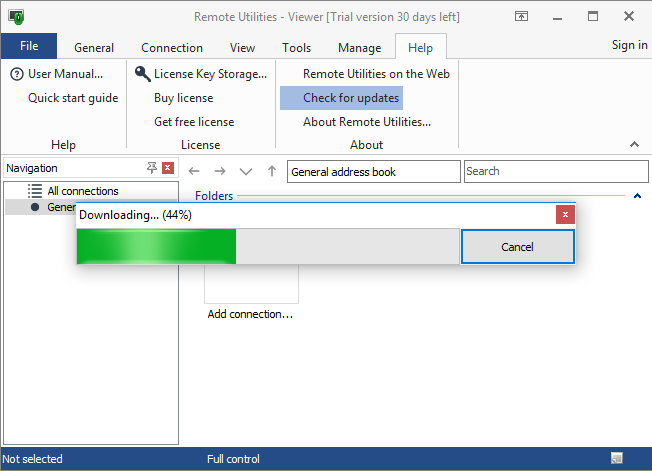 Click Yes and the Viewer will automatically download and update itself. Your address books and Viewer settings will remain untouched. As always we are open to your questions and suggestions. Feel free to visit this discussion thread on our community forum or submit a ticket. We will be happy to provide any assistance.